Beat out 94 others for a spot. A pair of Kiwi titles are among six ANZ indies selected for display at PAX Australia. Arena brawler Grabity and FPS Sky Noon will be showcased at the popular expo, which runs from October 27-29 at the Melbourne Convention and Exhibition Centre in Australia. When discussing Grabity's creation with us last month, Team Ninja Thumbs' Moritz Schlitter called it "Super Smash Bros. with Half-Life gravity guns". Sky Noon is a western-themed multiplayer FPS that plays like 3D Smash Bros. with guns. You can read the story behind its invention here. Joining those two titles at PAX is EarthWork Games' RTS Forts, Shadowplay Studios' 2D shadow puppet adventure Projection, The Voxel Agents' surreal puzzle adventure The Gardens Between, and Growl Interactive's VR party game Virtually Impossible. The six games were chosen by industry vets from a pool of nearly 100 titles from Australia and New Zealand. "I'm consistently blown away by the development communities in Australia and New Zealand," said Penny Arcade and PAX co-founder Jerry Holkins. "Every year I'm at PAX Aus, the scene is like a best of album. I can't wait." There's more info on PAX Australia over on the official website. Forts is a physics-based RTS game of building, battling and causing rubble, in which players construct their base from scratch, arm it to the teeth, and blast their opponent's fort to bits. Collect resources, develop your tech-tree, unlock advanced weapons and target your opponent's weak points to feel the satisfaction as their fort comes crashing down in glorious real-time physics! Forts' audio director, Jeff van Dyck, is a two-time BAFTA award winner whose resume cites the biggest franchises in gaming including FIFA, NHL and Need for Speed. 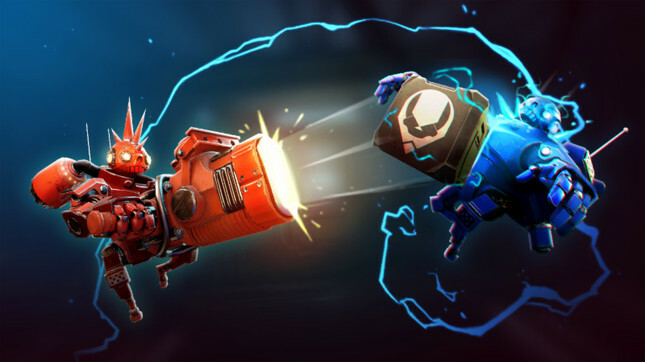 Grabity is a physics-based, arena brawler where 2-4 players wield grab guns to turn objects into lethal projectiles or makeshift shields. Twin-stick twitch reflexes combine with tactical thinking in this side-on, 2.5D grab 'em up - best enjoyed with friends couch-style for maximum trash-talk and combat shenanigans! Projection is a 2D shadow puppet adventure about light manipulation, curiosity and lost art. When the world is made of shadows, the one who can control the light can control the world. The themes of the game are closely related with popular tales from Indonesia, China, Turkey, Greece, and England. Sky Noon is a multiplayer first-person shooter set in an alternate Wild West, where Smash Brothers inspired push and pull combat takes place on floating islands. Players are equipped with a grappling hook, a lasso, an arsenal of weapons and abilities. There is no health in Sky Noon, instead players need to outflank and outplay their opponents to knock them off the 'Floating Frontier', an alternate Western world in the clouds! The Gardens Between is a surreal puzzle adventure that follows best friends, Arina and Frendt, as they fall into a mysterious world of beautiful garden islands. The player can traverse back and forwards in time to discover each garden's secrets and, along the way, reveal a story about friendship, childhood and growing up. The Impossible VR Party Game. Challenge your friends to a marathon of ridiculous challenges. Deceivingly simple, hilarious for players and sure to bring the room to its feet. Who will go the furthest? Players will compete in a kart race to achieve the furthest distance. But beware, in order to advance you will have to overcome impossible challenges.